Six months after they were reported to have been seeking royalties for selling their ideas, the brothers appear to have changed their course, and were unveiling a car of their own making in the December 1908 issue of the magazine Motor Age (below). The part of the cars that we see was in fact built by a coachbuilder in Racine, The Racine Manufacturing Company (which grew out of Racine Novelty Company, a maker of ironing boards) and piano stools. RMC was situated just a lot away from the Piggins plant and it had ventured in this period into bodybuilding on behalf of vehicle manufacturers. RMC's history is extensively discussed in Mark Theobald's 2004 article on the Coachbuilt website, where the Piggins ambulance is depicted as one of RMC's bodies. We can only conjecture about the meaning of this, but the form of the December 1908 announcement, using the formula, "This is the motor... This is the car...", suggests a possible explanation: that only the engine was a Piggins production, whereas everything else in the car was conceived, designed and built separately, perhaps by another company. Racine Manufacturing Company (RMC) had capital, a big plant and a large workforce of 400, but it might have needed a "front company" and a separate brand to enter the car business so as not alienate its own automobile company customers. It is conceivable that RMC's owner, George W. Jagers, was eager to catch up with the rapidly expanding Mitchell company, soon to become five times RMC's size, and therefore approached his small neighbour, the Piggins workshop, for help. 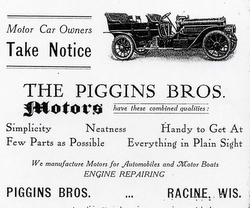 If the reference books are correct, the full-fledged Piggins Brothers' six-cylinder car arrived on the market in 1909. The Automobile Blue Book of Wisconsin (1909-1910, ed. KUEHL, George W.) lists Piggins Bros. as one of seven automobile manufacturers in the state (the others were J.L. Clark Carriage Co., Johnson Service Co., Thos. B Jeffrey Co., Kissel Motor Car Co., Mitchell Motor Car Co. and Frank Toepfer's Sons) and contains an advertisement stating: "The Piggins Bros. motors have these combined qualities: simplicity, neatness, handy to get at, few parts as possible, everything in plain sight. We manufacture motors for automobiles and motor boats. Engine Repairing." It was a large and stylish car, but its market history was to be short. Whether the problem was the price of the car, engineering issues, or the opposition of local or national competitors, the Piggins Brothers car does not appear to have found many buyers. The character of the car is discussed in more detail below. 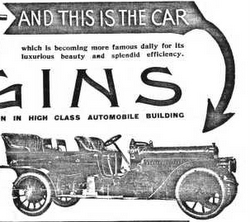 In the summer of 1909, the Piggins car venture and the Racine Manufacturing Company were to be "consolidated" into a single unit, according to Kimes and a contemporary report in the The Horseless Age. Mark Theobald speculates that this merger may have been negotiated about, but may have simply petered out and never happened. At any rate, the Piggins brothers do seem to have remained committed to truck construction in place of car-making. The car project would have suffered its terminal blow in any case several months later when the RMC factory was ruined in a December 1909 fire (see STONE, Fanny S. (ed); Racine, Belle City of the Lakes, vol II; Chicago, S.J. Clarke, 1916). It is even possible that the fire, with its opportunity for RMC to start all over again with an insurance pay-out, was a welcome solution to the business difficulties that the car created, though this is only speculation.